Last year I decided to join Nester’s 31 Days series – an invitation to write for 31 days straight for the month of October, and I really liked it. But I also learned a couple things that I thought I’d share with you if you’re thinking of joining this year! So deciding to write for 31 days straight at first seemed completely intimidating and exhausting. How would I continue to be inspired to write every night? How do I choose a topic that would be relevant for 31 days? Well, I worked through some of those questions and would love to share with you, because I love what participating in 31 Days does for my blog. It’s not about increased traffic, because I don’t know that I saw a huge increase. But I now have last year’s 31 days to credit for my passion to refocus my blog on encouraging, inspiring and equipping women in community. And I have great content that I’ve used as the groundwork for other projects and even talks I’ve given at conferences! 1. Choose the right topic. You can write for 31 days about anything. Seriously. You can do 31 Days of Guest Posts if you want, or 31 Days of Cat Pictures. Maybe even 31 Days of House Cleaning Tips (if you do, I’ll be reading that one especially if your first tip is “how to hire someone to clean your house). But before you settle on your topic, pray about where your passions are. What do you love to talk about? What gets you excited when you have the chance to share about it? And then, when you feel like you have a topic you can’t wait to talk about for a WHOLE MONTH, brainstorm some post ideas. If you love the color blue and think you want to write 31 Days of The Color Blue, I’m thinking you might run out of things to say. Try to pick a topic you love and one that is generic enough to stretch across several sub-topics so you have a lot of fun things to write about. 2. Plan ahead. Now that you have your topic, plan your posts. This one is hard for me because it’s so out of character for the way I write. But I knew after last year that if I tried to write EVERY DAY in October I would give up and never finish my series. So this year I opened a Google spreadsheet, put every date for October on it, and wrote down a post idea for each day. I also noted where I would have posts on other sites so I wouldn’t forget to promote those! 3. Be creative. Last year I think I actually wrote a traditional blog post every day. This year I wanted to mix it up a little. As a reader, I don’t know that I would ever read a 500 word blog post every day from the same blogger, and I don’t want to lose readers or bore anyone while I do this. So on my Google spreadsheet I also made notes about the types of posts I wanted to do: blog post, video, devo, inspirational image, etc. 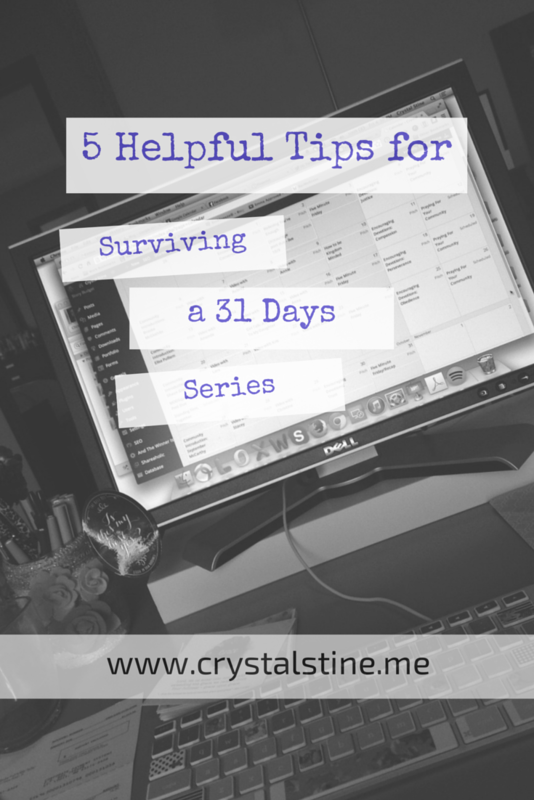 A 31 Days series doesn’t need to be 31 Days of 500 Word Blog Posts With Pinnable Images! 4. Automate. After all that planning ahead, it can be hard to keep track of it all. So I use the Edit Flow calendar in my WordPress dashboard to get an overview of where my posts are, and what they still need. I also automate blog post promotion with Buffer and Hootsuite (for Twitter), and Latergramme for Instagram. If you have a Facebook page you can schedule those post in advance, too. Then when the post goes live, you’re free to engage in comments and responses live instead of spending all your time promoting! 5. Give yourself grace. I don’t expect to have 31 blog posts scheduled by the end of September. I actually leave room open on that Google spreadsheet to write “live” each week because sometimes God gives me a word I just can’t keep to myself. And life doesn’t just stop in October. There will be days a post goes live on the wrong day (um. that’s actually already happened during this series. woops.). There will be days I forget to promote a post, or I write a draft and never add an image. I’ll be at several conferences during October. I’ll forget to link to things that I wanted to link to, and I’ll never get around to reading half the bloggers I wanted to read at the beginning of the month. And that’s all ok! Keep going! So you’ve planned all your content for the month…now what? Personally, I have a project I want to work on that keeps getting pushed to the side because of my blogging the night before routine. And there are blogs I want to catch up on, people I want to interact with, and women I want to cheer with and I haven’t had the time or energy. So 31 Days for me will be a time to do those things. And at the end of it? I might have some more content to use in the future for an eBook, a devo, a printable, or in a talk at a conference – but I know I’ll have shared my heart and what I’m passionate about – and stuck to my goal of encouraging, equipping and inspiring. Are you joining 31 Days? Be sure to follow Nester on Instagram & Twitter for the latest updates, like the hashtag to use (#write31days) and a brand new site she’s created just for this! Yay! Crystal, these are awesome tips. I want to try it this year & love the inspiration in #3 to mix & vary. Thanks for the encouragement! Thanks for the great tips! I’m trying to get a lot of work done ahead of time so that I am not stressed out or tempted to neglect other responsibilities. Also, I’m already planning on taking a break every Sunday and not having any post for those days. I don’t think my readers will mind, and it will be a nice weekly break. Love these tips! I am participating for the first time this year. I wasn’t ‘brave’ enough to do it last year, and have been thinking and planning for it all year. Not that this makes me any more organised, just totally pumped to do it!!! I am wondering though, what is a devo? This was so incredibly helpful! This will be my first time participating and I haven’t blogged in over a month, so I know it will be challenging. I will be doing “31 Days to Becoming a Self-Published Author”. I have a list of running post ideas for October’s challenge and decided last night I’m going to put them all on notecards and try to get them organized that way. It’s a little “old school” but I think it will help me plan out the flow of the month a little better. Thanks for all the great tips! Crystal, thanks for the tips (and answering Kate’s question above!) We appreciate you taking the time to “coach” us newbies! I love tip #3! I didn’t think about mixing up the posts like that. Last year was the first time I joined the Nester’s 31 Days, and I wrote the day of. It was…hahaha 🙂 Let’s not go there. Thanks for these tips. They’re already helpful even if I don’t have a topic yet. Thank you for the ideas! I have my topic and some of the posts pre-written but not all. I was coming up blank for the remainders, but the tip for mixing up the types of posts, was very helpful. Thanks for this, Crystal! Definitely going to share these tips with those who are planning to do 31 Days of Five Minute Free Writes with the Five Minute Friday community! One quick question: What is the “Edit Flow” calendar, and how do I find it in WordPress??! Thank you so much for these tips. You have give just a little more encouragement to join in this year after just observing last year. Great tips! I plan on joining again this year! It is such a great way to really flex those writing muscles!